The oldest child of a family living in extreme poverty in Lourdes, France, Bernadette was born in January, 1844. Never healthy in her lifetime, she suffered asthma and other maladies during her childhood that stunted her growth and kept her from attending school. The result, and Bernadette’s inability to read, meant that she could not receive her First Communion until she was about fourteen. It was at about this time that Bernadette experienced her visions of the Blessed Virgin Mary. On February 11, 1858, Bernadette, a sister, Toinette Marie, and a friend went out to gather firewood—a routine chore in the cold winter. When they reached a stream which fed the river Gave, the other girls decided to take off their shoes and stockings and cross the stream in their search. Bernadette, with her poor health, understood that her mother would be upset if she went into the chilly water and so stayed behind. But, after some time, Bernadette grew impatient when her companions didn’t return. She also crossed the stream to the grotto on the other side. As she approached the grotto, Bernadette felt a strong wind. As she looked up, she saw a beautiful lady in a long white dress with a blue sash and a white veil. The lady was holding a rosary. Smiling at Bernadette, the lady beckoned to her. Though she was somewhat frightened, Bernadette pulled out her rosary and prayed with the lady who, when they were through, vanished. This was Bernadette’s first vision. Over the next seven months, she was to have many more. Bernadette told the other girls of her vision as they returned home, but bound them to secrecy. As might be expected from young children, they could not keep this to themselves. Her mother forbade her to go back to the grotto, but, a few days later, Bernadette felt an irresistible calling to return where, once again, she recited the rosary before the lady. On her third visit, the lady spoke to Bernadette directly for the first time and asked her to return each day for the next two weeks. As word of Bernadette’s visions spread throughout the region, more and more people came to witness the apparitions. While none of the spectators could see or hear the lady, she gave Bernadette some instructions. Bernadette was to do penance for sinners, she was to ask the priests to come in procession and to build a chapel on the site, and she was to drink of the water from the spring in the grotto. The lady also told her that she would not attain happiness in this world, but would in the next. Bernadette had to dig to reach water that trickled from a spring in the grotto, but was flowing steadily by the time Bernadette returned. Many were skeptical of Bernadette’s visions, with some of the local officials threatening to put her into prison for fabricating her story. But, Bernadette’s parish priest, also skeptical at first, asked her to find out the lady’s name and, as a sign, to make the rose bush where Bernadette saw the lady come into bloom out of season. The first miracle at the grotto followed the twelfth vision on March 1, 1858. That night, a girl with a misshapen arm who was a friend of Bernadette from Lourdes plunged her arm into the waters of the spring. She immediately regained full use of her arm. A crowd of eight thousand came to the grotto for what would be the fifteenth vision on March 4, 1858. Many were expecting a miracle, but no sign was given and Bernadette still had not learned the lady’s name. For a few weeks following this visit, Bernadette felt no compulsion to visit the grotto, but, when she returned on March 25, she asked the lady, “Please tell me your name.” The lady responded, “I am the Immaculate Conception.” The words meant nothing to Bernadette, but she ran back to the village repeating the words so that she would not forget them. Just four years earlier, in 1850, Pope Pius IX had declared the dogma of the Immaculate Conception. Bernadette did not know this and her parish priest, aware of that, now began to believe that the girl was seeing the Blessed Mother. Bernadette was to have two more visions: in April and July of 1854. In the first, she was holding a burning candle. The flame licked at her hand, but she was not burned. This was witnessed by a doctor. In the last and final vision, the eighteenth, Bernadette’s access to the grotto was blocked by a barrier and she was unable to cross the stream. Nevertheless, she felt that she was standing exactly where she had stood through all of the previous visions. Within weeks of Bernadette’s final vision, her local bishop began an inquiry into the authenticity of these apparitions. After a four-year study, he submitted his opinion that these were of supernatural origin. A few years later, Bernadette was placed in the care of the Sisters of Charity in Nevers and, at the age of twenty-two became a member of that order, taking her vows in October, 1867. Having suffered pulmonary problems throughout her life, Bernadette died of tuberculosis on April 16, 1879. 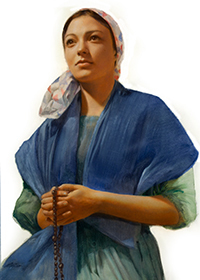 St. Bernadette was canonized by Pope Pius XI in December, 1933. She is the patron of Lourdes as well as of those suffering bodily ills, and of those who are ridiculed for their poverty. She is honored on April 18 in France. Bernadette's message today: All of us have been given gifts by God, even those who are suffering. We are meant to use these gifts for the benefit of those around us. How are you using those gifts that you have been given by God?